Huge bubbles of ionised hydrogen gas mark the home of a colourful stellar nursery in the Large Magellanic Cloud, a satellite galaxy on the Milky Way’s doorstep at a relatively close 160,000 light years. A region in the LMC known as LHA 120-N 180B, made up of a gargantuan bubble of ionised hydrogen surrounded by a quartet of smaller bubbles, is home to a massive young star with 12 times the mass of the Sun that is emitting a tightly collimated jet stretching across 33 light years (see second image below). 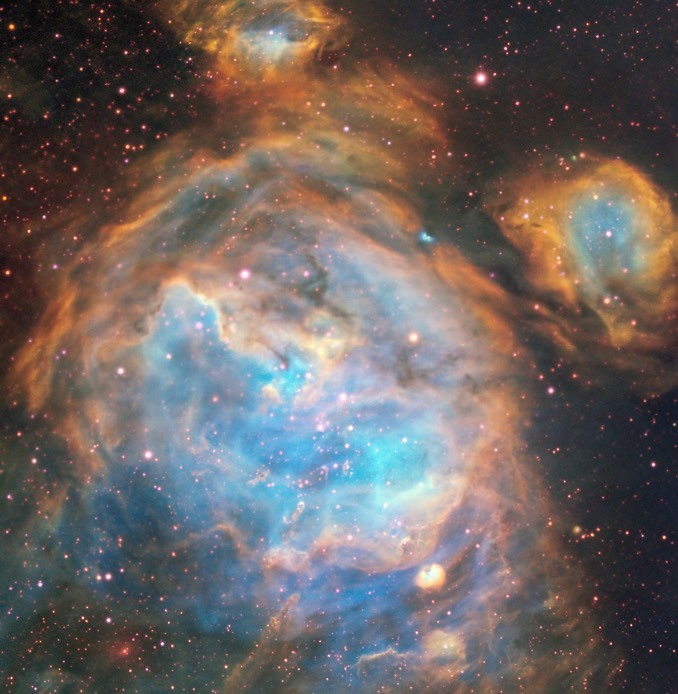 Vast bubbles of ionised hydrogen gas mark one of many spectacular stellar nurseries in the Large Magellanic Cloud. Image: ESO, A McLeod et al. 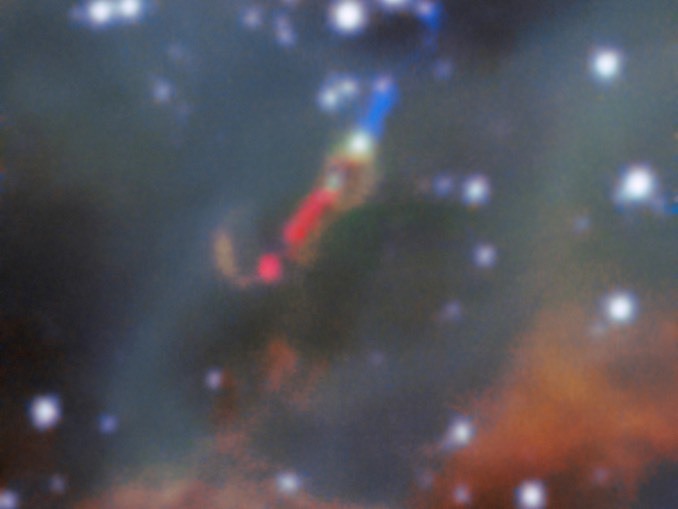 Known as Herbig-Haro 1177, it is the first such jet observed in visible light in another galaxy, thanks in large part to the relatively small amount of dust in the LMC. 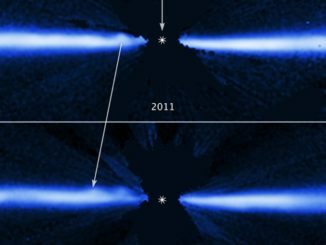 Such jets are usually associated with accretion discs and have been observed extending from both low- and high-mass stars. This image was captured by the Multi Unit Spectroscopic Explorer instrument – MUSE – on the European Southern Observatory’s Very Large Telescope. A 33-lightyear-long jet found shooting out of a massive stellar object deep inside a stellar nursery in the Large Magellanic Cloud. Image: ESO, A McLeod et al. 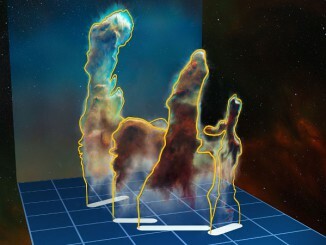 The iconic 20-year-old Hubble image of the Pillars of Creation is reinterpreted in three dimensions by the MUSE instrument on ESO’s Very Large Telescope, suggesting that the Pillars of Destruction might be an equally apt name. 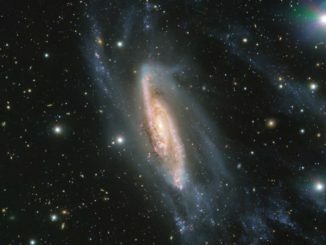 The European Southern Observatory’s Very Large Telescope captured a sublime view of galaxy NGC 3981 some 65 million light years from Earth, showing stretched out spiral arms that may indicate past gravitational encounters with other nearby galaxies.